Talks given from 2009 till now: see my agenda archives. Recent or forthcoming talks: see my agenda. Pie Mathematics Association, Chennai (India). Islamabad, COMSATS Institute of Information Technology (CIIT) Department of Mathematics in the Faculty of Sciences and National University of Science and technology (NUST), School of Electrical Engineering and Computer Sciences (SEECS). Exposé au Maths-Club de l'IREM, Université Paris Diderot, lundi 26 octobre 2009. Université des Sciences et de la Technologie Houari-Boumediène (USTHB), Alger, 8 juin 2009. Two-day International Conference on Number Theory, October 17 - 18, 2009, Kinki University, Iizuka, Fukuoka (Japan). Analytic number theory and related topics, RIMS, Kyoto. Japan. Organizer : Hirofumi Tsumura. International conference on "Analytic Number Theory" ant2009, TIFR Tata Institute of Fundamental Research. Conférence CRM , Université Laval, Québec, Canada. Autour de l'équation de Markoff x^2+y^2+z^2=3xyz (pdf: 5,7 Mo), screen pdf 5,8 Mo, 208 p. print pdf 4,9 Mo, 25 p.
Colloquium de Mathématiques, Département de mathématiques et de statistique, Université Laval, Québec (Canada). Exposé aussi donné au colloque de théorie des nombres de St Etienne le jeudi 5 juin 2008.
version révisée de l'exposé précédemment donné à la Journées des doctorants en Mathématiques de la région Nord Pas de Calais, Wimereux, Lundi 31 mars 2008. Voir aussi mon cours de M1 du 23 janvier 2009: Équations Diophantiennes (pdf: 7,9 Mo). Yamoussoukro (Côte d'Ivoire - Ivory Coats). May 19 - 22, 2009, conference "Modular Forms and Function Field Arithmetic". From classical arithmetics to information science: some applications of abstract research. (powerpoint ppt file, 3,2 Mo). Lahore University of Management Sciences (LUMS) under the programme French Science Tour in Pakistan of the French Embassy in Pakistan and the network of Alliances Françaises. at Pune and Guwahati, October 17 - November 10, 2007, under the programme French Science Today of the French Embassy in India and the network of Alliances Françaises. Transcendental Number Theory: Schanuel's Conjecture. screen pdf 6 Mo, 111 p. print pdf 5.7 Mo, 16 p.
Heidelberg Colloquium organized by the Institute for Mathematics. International Conference on Number Theory and Modular Forms, Srinivasa Ramanujan Center, SASTRA University, Kumbakonam (Tamil Nadu, India), December 21, 2008. On the so-called Fermat-Pell equation screen pdf: 3.2 Mo, 194 p. print pdf: 1.2 Mo, 21 p.
Presentation of the CIMPA - Centre International de Mathématiques Pures et Appliquées (ppt: 8.9 Mo). Bhutan: Sherubtse College, Royal University of Bhutan, Kanglung, December 4, 2008. College of Science, Salahaddin University, Hawler (Erbil), Iraqi Kurdistan Region, October 9, 2008. October 12, College of Science, Dohuk University, Duhok. June 30 - July 11, 2008. Part 3: Auxiliary functions in transcendence proofs (see above "The SASTRA Ramanujan Lectures"). Colloque de théorie des nombres, Jeudi 5 juin 2008, St Etienne. L'équation dite de Pell-Fermat x^2-dy^2=+- 1. Université Blaise Pascal, Clermont Ferrand, Séminaire de Mathématiques Pures. Colloquium de la Fédération Denis Poisson. Colloquium de l'Institut Élie Cartan, Université Henri Poincaré Nancy 1. An introduction to irrationality and transcendence methods. Arizona Winter School AWS 2008: Special functions and Transcendence, Tucson, Arizona (USA). Lecture 1: Historical introduction to irrationality Slides March 15, 2008; video: part 1 and part 2. Lecture 2: Historical introduction to transcendence Slides March 15, 2008; video: part 1 and part 2. Lecture 3: Elliptic functions and transcendence Slides March 16, 2008; video: part 1 and part 2. Lecture 4: Auxiliary functions in transcendence proofs Slides March 17, 2008; video: part 1 and part 2. Lecture 5: Conjectures and open problems Slides March 18, 2008. video: part 1 and part 2. Projects by Chuangxun Cheng, Brian Dietel, Mathilde Herblot, Jingjing Huang, Holly Krieger, Diego Marques, Jonathan Mason , Martin Mereb and S. Robert Wilson, with the help of Georges Racinet. Département de mathématique de l’université d’Angers, Colloquium. Jeux de cartes et de chapeaux, transmission de données et codes correcteurs d'erreurs (fichier powerpoint, 4 Mo). Université de Haute-Alsace, Séminaire Mulhousien de Mathématiques. Pour préparer cet exposé: quelques questions préliminaires. Playing with cards and hats - data transmission and coding theory (powerpoint ppt file, 3.7 Mo). Some recent results in mathematics related to data transmission. (powerpoint ppt file, 5,6 Mo). October 17 - November 10, 2007, French Science Today, India. Slides of the lectures I gave on this topic in , Pune and Guwahati , October 17 - November 10, 2007. Lecture also given on December 5, 2007 for the students of the School of Information Security Engineering, Shanghai Jiao Tong University, China. History of irrational and transcendental numbers (pdf file, 4,3 Mo). Institute of Science, Bangalore on November 6, 2007. School of Mathematics & System Science, Shandong University, China, on November 30, 2007. 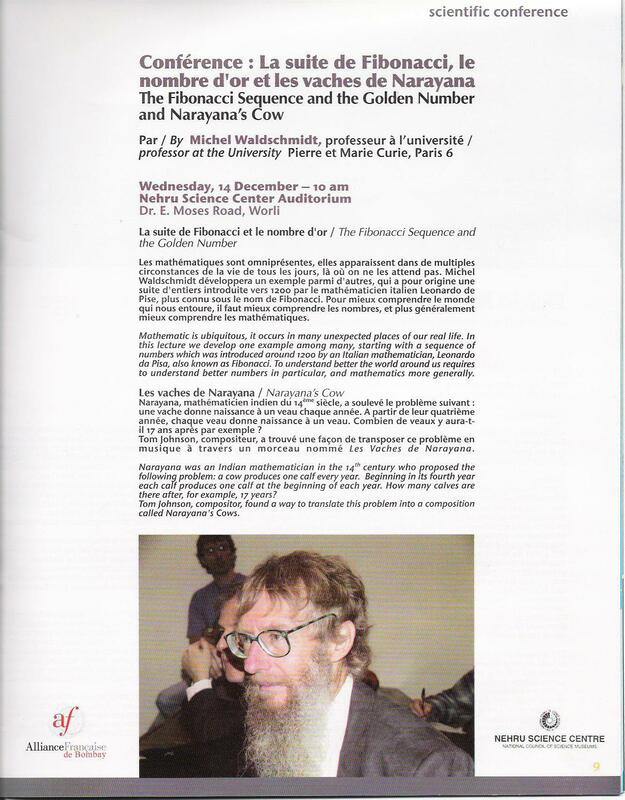 December 4, 2007, Lecture for the students of Shanghai High School (SHS), China, on History of irrational and transcendental numbers (pdf file, 4,9 Mo). Colloquium IIT Bombay , India on January 5, 2008. Variante des exposés sur Questions d'irrationalité (et de transcendance): hier et aujourd'hui donné à Strasbourg le 23 mars 2007 et Irrationality and transcendence: early history and developments à Udine le 3 mai 2007. Colloquium de l'IRMAR, Université Rennes 1. Colloquium de l'Institut Fourier, Université de Grenoble. International Conference on "Number Theory and Combinatorics", Srinivasa Ramanujan Centre of SASTRA University, Kumbakonam, India. (Similar talk also given at Indian Statistical Institute (ISI), Kolkata, India on November 23, 2006). INTERNATIONAL CONFERENCE ON NUMBER THEORY AND RELATED TOPICS, Institute of Mathematics, Academy of Sciences, Hanoi, Vietnam. Slides of the lectures I gave at Indore, Bhopal, Chandigarh, Delhi, Ranchi, Kolkata and Chennai in November 2006, under the programme French Science Today of the French Embassy in India and the network of Alliances Françaises. Lecture slide [ppt, PowerPoint file] ~ 15 Mo on the site of the Pacific Institute for the Mathematical Sciences (PIMS). 9th Canadian Number Theory conference (CNTA 9), Canadian Number Theory Association, University of British Columbia, Vancouver, British Columbia. Séminaire de théorie des nombres de l'Université Laval, Québec. Congrès International d'Algèbre, Théorie des Nombres et leurs applications, Faculté des Sciences d’Oujda les 11 et 12 mai 2006, Saïdia les 13 et 14 mai 2006, Maroc. Diophantine Approximation and Heights, ESI - Erwin Schrödinger Institute, Wien. Keio University, Yokohama, Japan, March 7-10, 2006. Conference on Diophantine Analysis and Related Fields 2006 in honor of Prof. Iekata Shiokawa. Shanghai Jiao Tong University, School of Information Security Engineering, Shanghai, China. International Conference on Number Theory & Mathematical Physics, Srinivasa Ramanujan Centre, Shanmugha Arts, Science, Technology & Research Academy (SASTRA) Deemed University, Kumbakonam, Tamil Nadu, India, December 20-21, 2005. The role of complex conjugation in transcendental number theory (pdf 18 p., 400 Ko). Narayana cows (powerpoint 49 p., 1.3 Mo), musique de Tom Johnson, interprétée par Daniel Kientzy. Annonce: Impressions, Alliance Française de Bombay, Déc. 2005, No 88, p.9. Jaihind under-graduate College, Churchgate (Mumbai). Colloque sur "Algèbre commutative - Codes correcteurs et Cryptographie" organisé par le Réseau Africain de Géométrie et Algèbre Appliquées au Développement à l' Université de Bamako (Mali) du 18 au 25 novembre 2005. Lecture at the University of Nairobi. XXIVth Journées Arithmétiques de Marseille, 4 au 8 juillet 2005. Kempner Colloquium of the Department of Mathematics, University of Colorado at Boulder. The University of Florida Mathematics Department, Special Year in Number Theory and Combinatorics 2004-05 with the support of the France-Florida Research Institute (FFRI). Colloque de la Société Mathématique de Tunisie, Mahdia, 15 au 18 mars 2004. February 25 and March 2, 2004. Korean Institute for Advanced Study, Séoul. "Days of Mathematics", Oulu, January 8-9, 2004. Inaugural address, 14th International Conference of Jangjeon Mathematical Society, Mysore, December 22-24,2003. Number Theory Conference, Bangalore (India). International Conference on Algebra and Number Theory, Hyderabad (India). DESY Zeuthen/HU Berlin Theory Seminar. Number Theory Seminar at NCTS, Central University, Chung-Li (Jhung-Li), Taiwan. Wien (Austria) October 6-10, 2003. Department of Mathematics, Shahrood University of Technology, Aug. 30-Sep.02, 2003. Séminaire de Théorie des Nombres de Grenoble. Ottawa CMS Winter Meeting 2002. Conference on Hilbert's problems today, Pisa (Italia). Pour un texte français sur ce thème: voir les transparents (pdf 40p.) de mon exposé aux 12èmes Rencontres Arithmétiques Caen le 29 juin 2001 et les notes de mon cours de troisième cycle de 2002. A course on multizeta values, The Institute of Mathematical Sciences, Special year in number theory at IMSc, Chennai (India), April 2011. (51 pages, updated March 2, 2017).